»Imitation, assimilation, innovation.« With these three words the great Clark Terry summed up the art of leaning musical improvisation. Salvador Dalí, the artist who melted time in his colourful and bizarre works, stated radically that a person who didn’t want to copy others would never manage to accomplish anything at all. 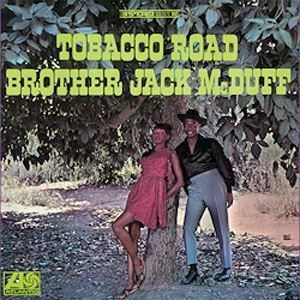 Brother Jack McDuff did plenty of copying and refined the good old standards on his "Tobacco Road" and made them blossom anew. Jack taught himself to play the organ and went on to transform the popular melody "Alexander’s Ragtime Band" into what one might call roughened up ball house jazz, were it not for the contrary saxophone, which soars over rasping organ clusters. For Brother Jack such spiritual sounds as in "And The Angels Sing" and his somewhat slanted version of the musing, dreamy "Wade In The Water" were an absolute must. It really rocks in "Can’t Get Satisfied", a gospel-like and delicately instrumentalised version of the blues evergreen. The organ does not necessarily always have the last word in this colourful mixture, but it is always very present as regards the sound and the distribution of the parts. And just once does McDuff let the instrument sing out on its glassy top register in "The Shadow Of Your Smile".